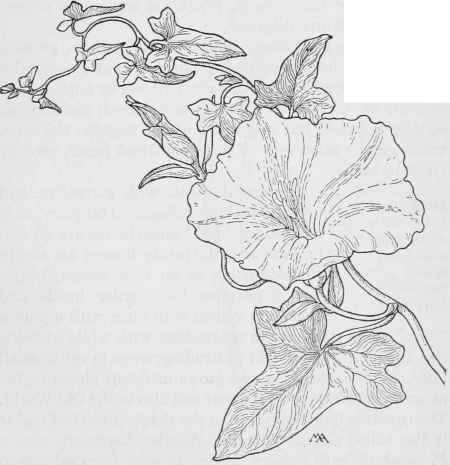 An attractive plant, with pretty foliage and large, pale flowers, the stems trailing on the ground and climbing over low bushes. The leaves are smooth and dark bluish-green and the flowers are about two inches and a half across, very pale yellow, almost cream-color, with stripes of slightly deeper yellow, tinged with pink. The anthers and the pistil are pale yellow and the flower-stalks have two bracts just beneath the calyx. There are many kinds of Cuscuta, or Dodder, widely distributed and difficult to distinguish; leafless parasites, without green coloring, with twining, threadlike stems and inconspicuous flowers, in clusters. The seed germinates in the soil and produces a twining stem, which attaches itself to a neighbor by means of suckers. These plants are easily recognized, for they look like tangled bunches of coarse thread, and are often very conspicuous on account of their coloring, sometimes making fine masses of bright orange-color, beautiful in tone, though the plants are very unattractive. They have other names, such as Love-vine and Strangle-weed. Yellow Morning-glory - Convolvulus occidentalis. PHLOX FAMILY. Polemoniaceae.